Hornady’s .308 Winchester is one of the best options for those looking for high quality, consistent, and accurate match grade ammunition. These rounds have an average muzzle velocity of 2700 fps and an 8.5 inch ballistic drop at three-hundred yards. 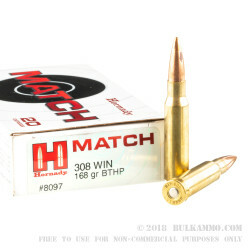 Each Hornady .308 Winchester bullet is encased in a copper full metal jacket (FMJ). The bullet is a lead, boat tail, hollow point intended to expand upon impact. The copper FMJ allows for greater accuracy as the rounds leaves the barrel, and the hollow point design is more readily condoned in public gun ranges due to the decreased liability of the round penetrating a target and traveling further than intended. 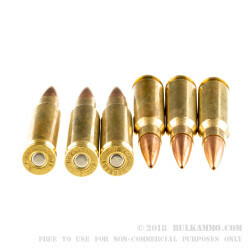 A non-corrosive boxer primer set into the Hornady’s brass casing ignites each round. 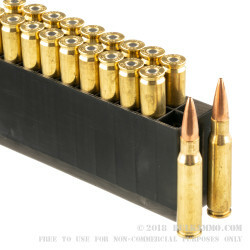 The combination of boxer primer and brass casing allows for shooters or ranges to reload spent cartridges. Overall, the HPBT .308 Winchester by Hornady is ideally suited for serious marksmen that want a consistent, accurate, and reliable ammunition. Good ammo. I liked the 155 grain version better. 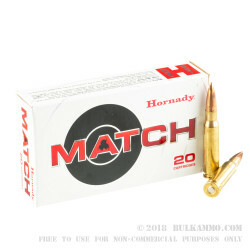 A: Hi Jerry, we do often have the Hornady match rounds in 200 round bulk deals, but at the moment, we are out of stock. Keep an eye on our website and as soon as they do come in, we will have them listed there.